Verizon's LG Revolution packs a punch with its LTE capabilities as well as its stunning 4.3-inch capacitive touchscreen for displaying media in a rich and crisp format. However what we often overlook in terms of protection and stability for our device is the most crucial and can inevitably mean life or death for your LG Revolution. The good news is that we've established a brief roundup of all of the most popular accessories for the LG Revolution based off of reviews from our customers here at Android Central as well as our loyal readers and expert team of Android enthusiasts. Interested to see what all is in store for your LG Revolution smartphone? Check past the break for more of the good stuff. Upon getting your new LG Revolution, you'll need at least the basics to get you started. Whether it's cases for protection, chargers to keep your Revolution ticking, car mounts for traveling or even memory cards to store your personal data on-- we've got it all covered here with this edition of Accessories Roundup for the LG Revolution. So let's get started, shall we? With so many cases to choose from, we won't disagree with the fact that it gets a little confusing at times deciding which case is best for you. If you're in the market for a more durable hard case that will protect against drops, then the Mobi Hard Shell Case is a good choice with its slim form factor. For a more basic style case, the Mobi Skin cases for LG Revolution provide a decent amount of protection. Made from silicone, these skins have cut outs for all the Revolution's features, but can be a pain to get in and out of pockets with their anti-skid surfaces. If you prefer the original look of your LG Revolution, then the Crystal Case is a great option. Made from a completely transparent plastic, this case allows the color and features of your LG Revolution to shine through while still providing all the protection of a standard hard case. Keeping your LG Revolution dry is extremely important for outdoor adventures, and the OverBoard waterproof case offers the perfect amount of protection with it's PVC exterior and waterproof clasps. You can even utilize your device while inside this completely waterproof case-- underwater or above! Whether you're a power user or not, you'll want to be sure that your LG Revolution stayed powered up throughout the day. The most basic of chargers on the market is the wall charger-- and this LG travel charger for the Revolution is the most popular among the rest due to it's compact design and OEM quality. The LG Micro-USB car charger for the Revolution is a great option for those looking to keep a charger in the car while traveling. Easily stored in a glove compartment, this LG Revolution car charger ensures your devices is ready to rock when you reach your destination. Keep your data up to date on your device by using this OEM Micro-USB data cable for the LG Revolution. Simply connect to your computer and transfer your data while your Revolution charges at the same time. While traveling you'll want to keep a safe and secure mounting solution for your LG Revolution in your vehicle at all times. The iGrip Universal Fit Sturdy Swivel Mount for the LG Revolution can be mounted on either your dash or windshield and is completely adjustable for different viewing angles. The Clingo Universal Vent Mount is becoming one of the most popular mounts on the market. Once mounted to your vehicle's AC vent, you can stick your LG Revolution right to the green pad and it stays safe and secure, even with bumps in the road. Best part is, it's easy to remove and leaves no residue! Lastly the Arkon Gooseneck Mount and Holder for the LG Revolution is your classic windshield-style mount that features a secure suction cup mount that attaches to any portion of your vehicles windshield and allows the gooseneck to be adjusted to what viewing angle of your LG Revolution is most comfortable to you. 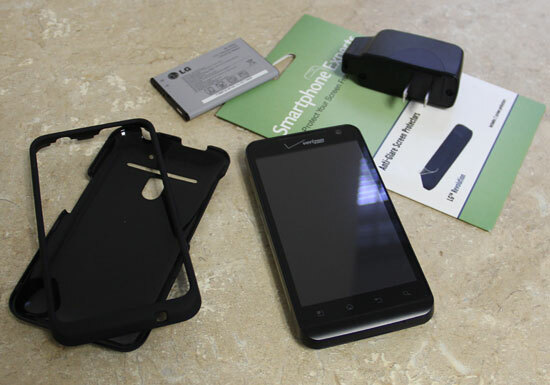 And rounding out our top accessories for the LG Revolution, we've got a trio of items that are too often overlooked. You never know when you won't have access to a wall or car charger, so it's times like these that having a spare battery for the LG Revolution handy can be a life-saver. This OEM 1500mAh battery ensures optimum performance and reliability from your device. Keeping your LG Revolution scratch-free should be at the top of your list, and not all cases will provide that level of protection for your device's display. These LG Revolution screen protectors are easy to apply and come with 2 in a pack so you'll always have an extra handy. The SanDisk 32GB microUSB card provides you with plenty of room on your LG Revoution for pictures, movies, music, apps and more. Now that we've covered the most popular LG Revolution accessories here at Android Central, we hope that we were able to shine some light on what's available for your device along with a few pointers to help get you started in the right direction. Keep in mind that we're always adding new items to our store daily, so be sure to check-in regularly for all the latest and greatest accessories for your LG Revolution.